Meet your ITI instructor, Gary Strahan. He has been involved in infrared thermography for 30+ years and an instructor for 25+ years. Gary Strahan has a wide range of experience with all aspects of infrared thermography. From the designing and manufacturing of infrared cameras to their many applications, his wide range of experience is astonishing. 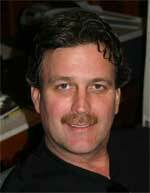 Gary Strahan is the current president and CEO of Infrared Cameras Inc and is a Level III Thermographer.